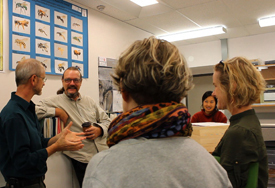 Faculty members in the Department of Biology at York U study every aspect of life, from the shape and function of biologically interesting molecules to the effects of climate change on ecosystems. Our professors are dedicated to advancing research in these areas and mentoring students to investigate life’s complexity and develop careers in the biological sciences. With 39 tenure-stream faculty and an additional 33 research faculty who are adjunct or cross-appointed to our graduate programs, we are one of largest departments of Biology in the country. Nearly 150 graduate students per year receive a top quality education on-campus in laboratories and at field sites around the world. Our graduate program is research intensive with low course requirements for M.Sc. and few or no course requirements for most Ph.D. students. Students gain valuable teaching and leadership experience though teaching assistant positions in undergraduate labs. We train our students in high calibre and publishable research. Our graduate students work in world-class labs and their research is funded primarily through their supervisor’s grants from the Natural Sciences and Engineering Research Council of Canada and the Canadian Institute for Health Research.